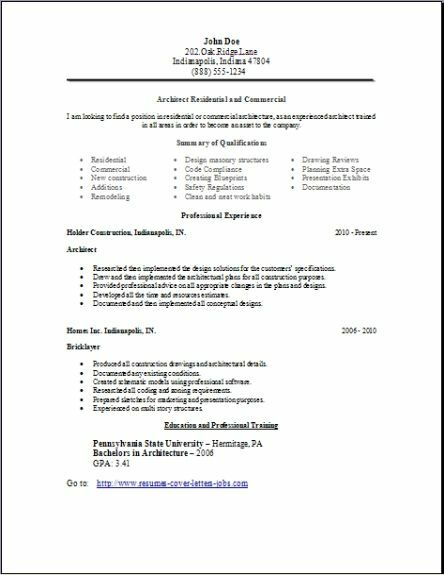 I'm positive your friends are interested about where they can find these great, and completely free, pre-formatted resumes. Do your friends a big favor and e-mail them our resume page that you are on now. Just use the convenient bookmark below. Also if you leave that file name without re-naming it, when you do decide you have time to begin editing the resume, it will be really easy to find on your desktop later. Do me a favor, bookmark our site now. Use these 3 architecture resume formats that are prepared and ready for you, editing the resume with your very own personal details soon after downloading the document on your desktop. The most efficient and easiest process to complete this task quickly is to just backspace one sentence individually, then just replace our example sentence with your very own job history information. 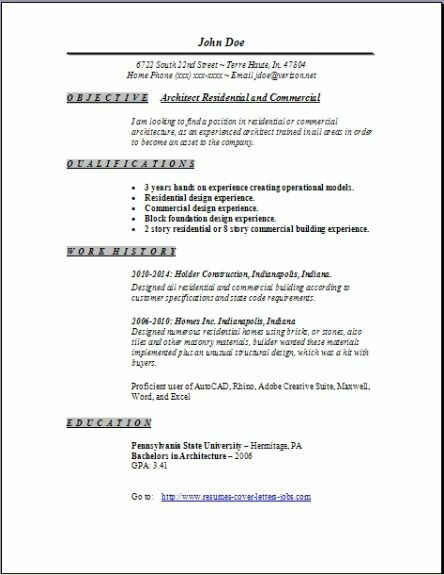 You can do this to all three architect resumes we offer above, choosing afterwards the one you like best. It is oh so very easy. 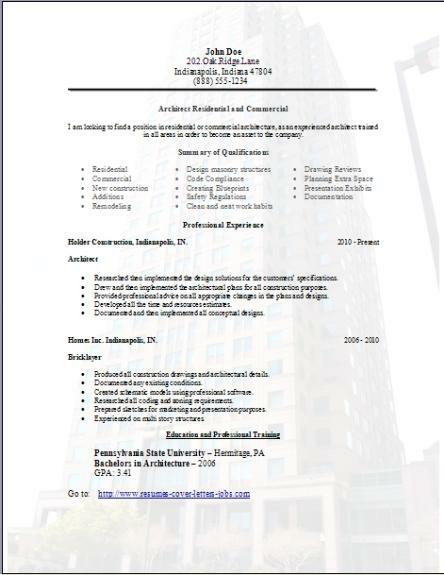 The building background is pretty cool I think, but for sure, the most simplest, time saving process for creating your new architecture resume is to download a free sample that we have in word format. This whole process will only take you minutes. Especially since you probably already have written down all your work history information on a previous resume draft. Want to pursue this occupation? You must obtain a professional degree from an accepted university in architecture. You can also afterwards gain experience by finding a paid internship program. By passing the Architect Registration Exam. All of our state architectural registration boards, will require each architecture graduate, to complete a very lengthy hard to find paid internship—most states mandate 3 years experience—before you can take an Architect Registration Exam. Architecture is a serious business in which your skills of technicalknowledge, management abilities, and a great understanding of business are just as important as your design talents. An architect hires on with a contract and accepts a commission from a business client. The commission will most often involve preparing feasibility reports, completing building audits, the design of one building or more often than not several buildings, structures that go with the project, and all the spaces in between them. The architect undertakes developing all the requirements the client wants incorporated into the building. Throughout the entire project (from planning to actual occupancy), the architect co-ordinates and leads a design team. An assortment of structural, mechanical, and electrical engineers and quite a few other specialists, are hired by the client or the architect or both, who work together to supervise that the work is coordinated to construct the design. An architect must be highly trained and understand all building and operational codes, the construction methods that are available to the builder in constructing the client's building and all structures, and maintain the desired results within perimeters of the actual costs and construction schedule. Work load while you are on a project is usually a standard work week, but when gearing up to meet a deadline the architect will often works many long hours even into the night. Architects are office-based professionals, but the work usually will mandate many visits to your clients and regular visits to the job site. Pay it forward below. Make all your friends very happy! Share.